The summer is here, and with that I have had a headache the past three days which is why there wasn't a Wedding-blanket Wednesday post this week (I have no excuse for last Wednesday, I must have forgot there was a Wednesday last week) So that post will have to come later this weekend I think. *Kio and I are superbusy but hopefully there will be a small surprise soon. And speaking of surprises, a co-worker of Mister M is having a baby and she was coming in to the office today with cake, so I prepared a little gift for the baby. 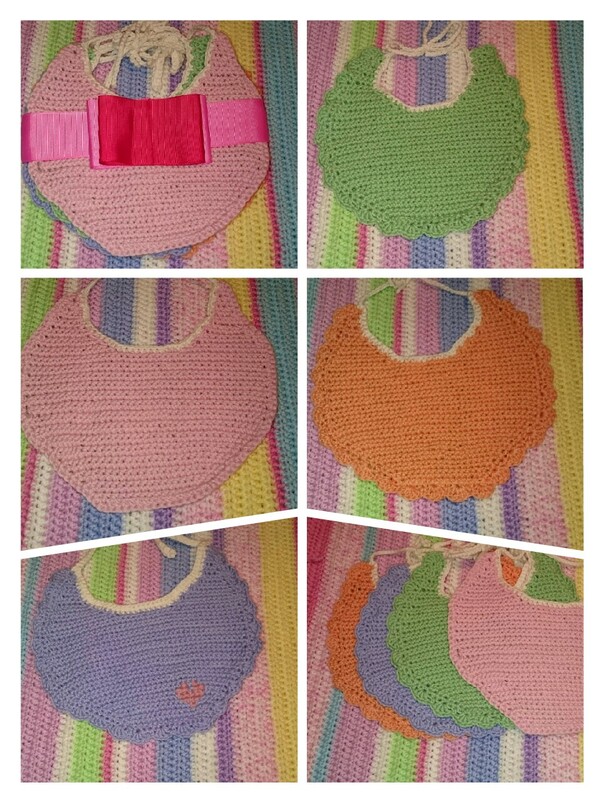 A set of four bibs, the green one is the newest and the one I haven't shown, the others I have made a little over time. So now I need to make more bibs, they were so much fun to make. I love the colours on these bibs and even if they might know the gender of the baby I pretended I didn't and just had fun with colours. The stash busting acrylic baby blanket is coming along nicely. I have a lot of fun with these colours too, Mister M claims they look like candy and that that yellow especially makes him feel like having a banana. But I think babies need those colourful fun things? Other than that I have made a bunch of wrist warmers and the pattern is coming closer to getting finished, *Kio and I are looking into yarn at the moment. And the gifts form my giveaway have been put in the post, but since it is a five day holiday at the moment, they will not get sent out of the country before after the constitution day (17th). So it will take a week or two before you get it. ^^ I hope you will like the gifts.